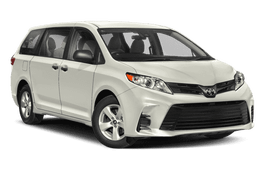 Correct Wheel Sizes, PCD, Offset, Rims and Tire specs for Toyota Sienna series. The width of the 16" Toyota Rims is 6.5". From what I understand, it is the 17" rim that is 7" wide. Rest of specs look accurate. This is for 2nd Generation Sienna. Would like to swap out our 2002 Sienna's wheels and tires (currently 205/70R15) for a larger size (perhaps light truck snow/terrain tire) as we only use it for camping trips and could use traction and an extra inch or so of clearance. Any suggestions? Would this set up work with snow chains? 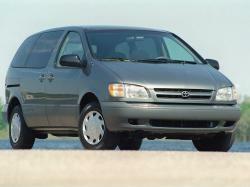 Information for the 1999 1st gen Sienna is incorrect, and this would apply to the entire 1st gen range, 1998-2003. The XLE trim had 16" wheels standard. Standard option for the CE and LE trim levels is a 15"x6.5" rim, 38mm offset, 60.1 center bore, and standard tire sizes of either 205/70rR15 or 215/65R15. Hi,Mike,thanks for your post.We will check the detail later. Hi,Jeo,Can you show the exact size of little big size rims and tire? Hi,Jay,try 19*9.0 Offset 42-45 bolt pattern 5*114.3 CB.66.6mm.But 19 inch is little large for your car.Try 18 inch. Thanks for the reply.can you send me the specs of the 18 inch tyre? What do you think of 235/50r18?do you think it will fit my van?thanks. Hi,Jay,yes,235/50/18 can fit for your car. I have a 2015 Sienna se and I am looking to put on snow tires. Dealer is recommending the usual 235 60 17 But a local shop (25 years in tire business) tells me 215 65 17 will be much better for winter tires. What should I do? Hi,Terry,Yes,the dealer is right,The stock rims size for your car is16'',so,If changed to 17'',it is ok.
Bolt pattern off a 2002 sienna 18 inch rimis 5x114. Will that work on a 17 in 5x 100 bolt pattern on a subaru? Hi John...so forester 215 65R 16 5 x 100 bolt pattern will not fit onto a 2006 sienna which has 5 x 114.3 bolt pattern? Hi, do you know if a 17" highlander rim will fit on my my 2015 sienna se? I just want to know if the 2009 Sienna rims fit the 2004 sienna ? Do the rims of any other model years fit a 2000 Toyota Sienna, if so which years? I have a 2011 Toyota Sienna LE. The tire size is P235/60/R17. 5 bolt pattern. I want to know if I can buy snow tires on rims from another make of vehicle that will fit my van. 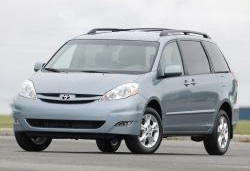 I just want to know if the 2004-2010 Sienna rims fit the 2011 sienna ? Hello, thanks for your awesome site; quick question. is it ok to use my old winter tire/rim combo of 225/60r17 on my new 2015 Sienna LE which is OEM 235/60r17? Overall diameter is 12mm but I would think the narrower tire might be even better in snow? Hi,John Crolwey,yes,225/60/17 is compatible for your car.You can use it for all wheels. Hi, i have a 2007 toyota sienna ce. Just wondering if i can put on winter tires with 205/70/R15? Thanks in advance for replies. Hi, I have a 2006 Toyota Seinna XLE and 225/60/R17 were on it when I purchased it new in 2006. 1 1/2 yrs ago some one blessed me with new tires only to find out at the wrong size was placed on them 236/60/R17. Now the front 2 won't pass inspection so I am borrowing a car now :(. Did the wrong size hurt my car? Do I get 4 correct size tires? Or get 2 of the wrong sizes? Thanks! Hi,Di,For 236/60/17,Does you input the right data?Please confirm again,And if it is 235/60/17,it is compatible with 225/60/17.For the inspection,Does you use aftermarket wheels? 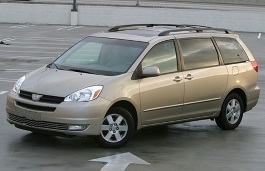 2nd Gen Sienna LE with 16x6.5" wheels: What is the largest H and W size that will fit under stock chassis ie no lift? Looking to go wide as possible and also taller for more ground clearance. Also, does use of SPACERS stress any components where it would wear out bearings or axles etc? Hi,John,225/65/17 is better.235/65/17 is not compatible with your current tires. 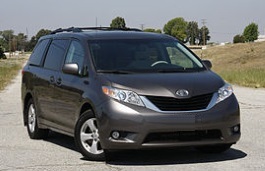 I have a 2013 Toyota Sienna LE AWD that has 235/55rf18 tires. This particular model with runflats does not have a spare and just as a back up for long distance trips I'm thinking of carrying spare. I found an inexpensive tire and rim but they are 17inch - would 17inch be ok? Hi,George N,What the 17'' rims size detail? Anyone know the highest clearance tire I can fit on my ''99 sienna,, 15" rims? ...any chance of 235 75 15's?? Hi,melo,you can try 235/55R18,it is the stock tire size.